Armor casing, manufactured from durable stainless steel, provides a protective covering for hoses. Intended to encase rubber or stainless steel overbraided hose, Armor Casing prevents hoses from kinking while still allowing flexibility. 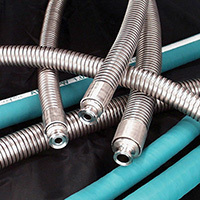 It is used on hoses typically found in the food, beverage, diary, chemical, and cosmetic industries as well as other process applications. Fits hoses ranging in size from 1/2" to 2" I.D. Armor Casing Crimp Ring Description Bend Radius Bend Radius Wgt.